What is Family Development and Self Sufficiency (FaDSS)? The Family Development and Self Sufficiency (FaDSS) program is an intensive in-home visitation program for families receiving family investment program payments (FIP) from the Department of Human Services. The FaDSS program design recognizes that at-risk families face many issues and respond well to long term, intense personal interaction with trained staff to move to emotional and economic independence. FaDSS believe that families can become strong, self-sufficient community members through their voluntary participation in the array of individualized services that the FaDSS program offers. Home visits are the foundation of Sieda’s FaDSS program. Visits in the home allow the family and the Specialist to foster a trusting relationship. During these home visits, an array of assessment tools are completed with family members. The family is assisted in identifying long and short term goals in conjunction with their Family Investment Agreement (FIA) that will enable them to become self sufficient. The FaDSS Specialist works with the family to identify the progress that has been made in meeting these goals. FaDSS provides advocacy, support and connections to community resources to assist the family as it strives toward independence. All FaDSS Specialists are Certified Family Development Specialists. Family must be receiving FIP to be eligible to participate in the FaDSS program. 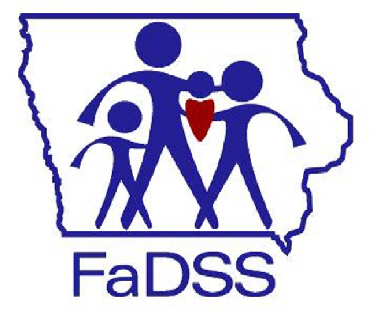 The FaDSS program is available in Appanoose, Davis, Jefferson, Keokuk, Mahaska, Van Buren & Wapello counties.